This impressive deciduous perennial will eventually produce huge displays of massive dark green lobed foliage, but you need plenty of space! Gunnera looks best planted near water in an informal semi natural setting, often being planted among with tree ferns and bamboo. Grows to 2m tall x 3m and spreads. This plant can become invassive. Not a plant for the faint hearted but well worth the effort if you have the space. Cultivation tips: Gunnera requires a deep moist fertile soil, ideally near a water source such as a pond or stream. 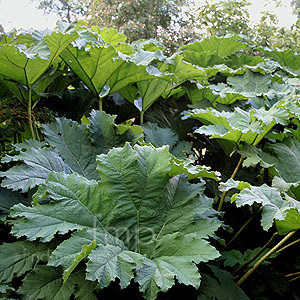 Plant in full / half sun and avoid very cold locations, as Gunnera has large tender growth points in winter . Cover crowns with straw mulch or cut back foliage in autumn to protect from frost and mulch again in spring to feed.